Talk to Her …and sit in this chair. Here’s a quick one. After writing a previous post on Pedro Almodóvar, I decided I needed to see all his films. My latest one is Talk to Her (Hable con ella), and just like the others before it I was intrigued, amazed, shocked and delighted. His story telling, the look of the film and his actors are all superb. So, it was truly an added bonus to see another famous chair in this movie. View of Alicia's father's office. This chair was designed by Charles and Ray Eames in 1956 for the Herman Miller furniture company. And now that I’ve noticed this chair once, I must notice it somewhere at least once a week. It’s in movies, on TV, in print advertisements. It even appeared in a Cole Haan ad on the side bar of my email. You might also notice a famous table in the scene from Talk to Her. It is Eileen Gray’s chromed steel side table from 1927. Built for the E 1027 house in the South of France, these tables were likely inspired by the chromed tubular steel furniture of the Bauhaus. Side table designed by Eileen Gray in 1927 for her E 1027 house (built between 1926 and 1929). It was originally meant to be a bedside table. I went to see Pedro Almodóvar’s latest movie in the cinema, Broken Embraces (Los Abrazos Rotas), this past weekend. Besides being amazed by his ability to tell a story and Penelope Cruz’s beauty, it delights me to report I spotted two chairs by Charles Rennie Mackintosh! 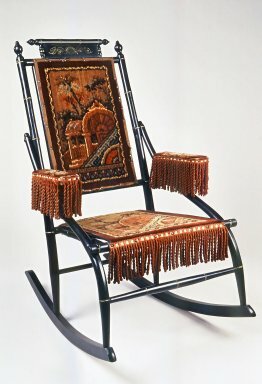 The chair, as seen in the image above,was designed to go in the master bedroom of The Hill House, built for Walter Blackie and his family in 1903. Charles Rennie Mackintosh designed the chair and the house. Walter Blackie was a book publisher in Glasgow, Scotland. Many of the books he published were fairy tales. So, The Hill House, very fittingly, has a subtle theme of roses and Sleeping Beauty. The lattice-shape of the back of the chair fits both in dimension and theme the stencils on the walls of roses growing on trellises. I was unable to find a still from the movie that included the Hill House Chair. It was the customary black, however, it had a red upholstered seat. There are two in Ernesto Martel’s dining room and they are visible in the scene pictured above. This is my first post in my new category of “Double Takes” where I plan to document quick views of famous design in movies and not get into the history, philosophy or interpretation of it all.